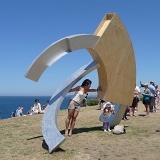 Staged alongside Sydney’s spectacular Bondi to Tamarama coastal walk, Sculpture by the Sea is Australia’s largest annual outdoor free to the public exhibition of sculpture. The 2008 exhibition featured over 100 sculptures from 7 different countries. 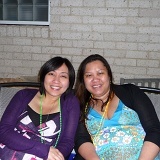 Kriscia and Kristyn Maslog-Levis are both expecting in December, so we had some neighbours and friends over to celebrate.